On March 4, 1943, the 15th Academy Awards were held at the Coconut Grove in Los Angeles, California. The Disney propaganda short film Der Fuehrer’s Face won the Academy Award for Best Animated Short Film, beating out the likes of All Out for V, Blitz Wolf, Juke Box Jamboree, Pigs in a Polka, and Tulips Shall Grow. Most of the shorts in this category, including Der Fuehrer’s Face, ridiculed the brainwashing tactics of Nazism and were very anti-German, save for Pigs in a Polka, which parodied Disney’s Three Little Pigs and Fantasia. The song for Der Fuehrer’s Face, written by studio composer Oliver Wallace, also proved to be very popular after it was recorded by Spike Jones and His City Slickers. Posted in Uncategorized and tagged 1940s, Academy Award Nominated, Academy Award winning, Donald Duck, Propaganda, Short film, WWII. Bookmark the permalink. On January 7, 1943, the wartime short film The Spirit of ’43 was delivered the U.S. Treasury Department. After the success of The New Spirit, the Treasury Department was more than eager to have Donald represent them again and encourage Americans to pay their taxes to help the war fund. After the debacle in the House for not paying Disney for The New Spirit, it was decided that the Treasury Department’s funds for the short would have to be approved by Congress in advance; the $20,000 came through quickly. Unfortunately, this amount wasn’t enough to pay for brand new animation, so the studio reused some footage from The New Spirit. A factory whistle blows, signaling payday. As Donald walks with his cash, he is confronted by his two inner personalities: the Thrifty Donald, who convinces Donald to save some of his pay; and the Spendthrift Donald, who appears after his money begins to burn a hole in his pocket. The Spendthrift Donald takes him to the Idle Hour Club, but Thrifty Donald reminds Donald that his income tax is due in four different payments. Donald is convinced to save right away to help the troops in the war, as he doesn’t want to save for the Axis. In the end, he punches out the Spendthrift, who in the end looks like Hitler. There is then a montage of what people’s taxes will go towards. Posted in Uncategorized and tagged 1940s, Color, Donald Duck, Propaganda, Short film, World War II. Bookmark the permalink. On January 23, 1942, the Donald Duck wartime propaganda film The New Spirit was delivered to the Treasury Department under the support of the War Activities Committee. It was directed by Wilfred Jackson and Ben Sharpsteen. This was the first propaganda film for the US Government by the studio since the country’s entry into World War II, and the Treasury Department hoped that Disney could provide a start of the new Revenue Act of 1942 and apply the funds directly to the war effort. The Department paid $40000 for the film, asking for a very short time frame to have the film ready no later than February 15. 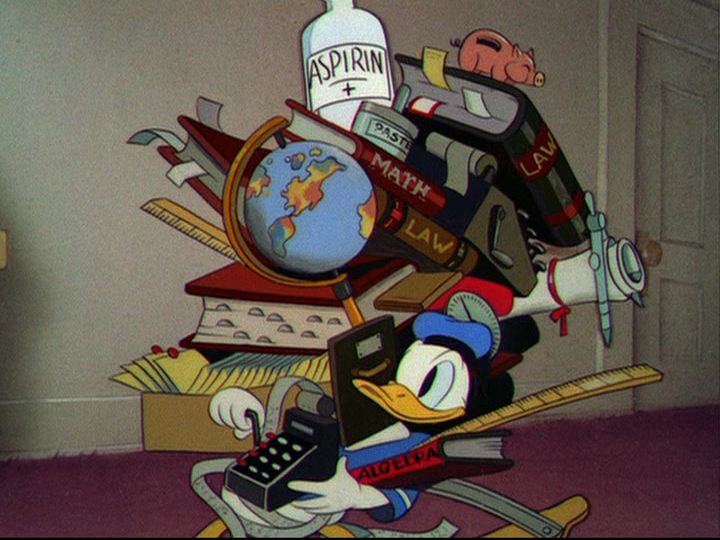 Although there was concern about using Donald Duck for the short film, Walt had argued that using Donald was similar to MGM using Clark Gable, and Department Secretary Morgenthau agreed. Donald was seen as a cathartic character for most Americans, and his anger and patriotism resonated with a public still reeling from Pearl Harbor. While Morgenthau was excited about the film, Congress voted to eliminate the $80,000 appropriation the Treasury had submitted to pay for the film and its marketing, as many anti-Roosevelt members thought it was a waste of money and nearly marked Walt as a war profiteer. 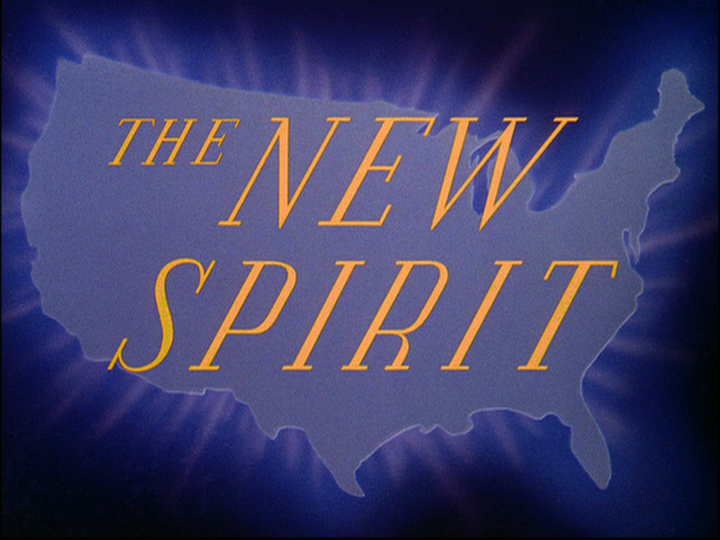 Fortunately for the studio, The New Spirit resonated with audiences, and was hailed by the media as “an excellent bit of persuasion,” as written by the Chicago Herald-American. A survey was conducted, and 37% of those that had seen the short said it had an effect on how willing they were to pay their taxes, with further members of the audience praising the film and criticizing Congress for its failure to pay the Studio. The New Spirit was also nominated for an Academy Award for Best Documentary at the 15th Academy Awards. The song “Yankee Doodle Spirit” is playing on the radio, with Donald dancing to its patriotic rhythm. As he listens to the radio program, Donald quickly readies himself for the threat of war. The radio announcer declares that there is something Donald can do for the war effort, and Donald states he will do anything. When Donald hears that the best thing he can do is pay his income tax, at first he is dismayed. The announcer goes on to say that his income tax is vital to the war effort, as the taxes pay for supplies for the troops to beat the Axis Powers. A new simplified form is presented, which is really all that Donald will need, along with a pen, ink, and a blotter. Donald fills out the form, and finds that he owes $13 for his taxes. He is so excited to pay his taxes that he races across the country to Washington DC to pay them in person. The announcer continues with what the taxes will be used for: factories that will make the ammunition and weapons for the soldiers, planes, and battleships. Posted in Uncategorized and tagged 1940s, Academy Award Nominated, Color, Donald Duck, Popularity, Propaganda, Short film, World War II. Bookmark the permalink. 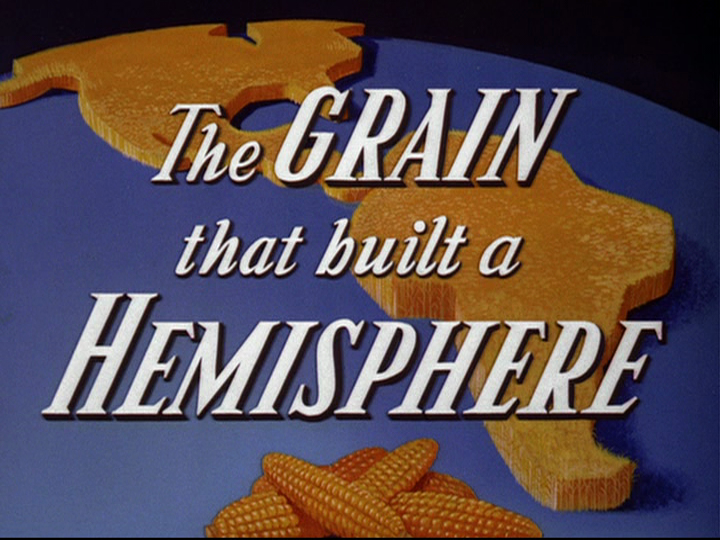 On January 4, 1943, the educational short film The Grain That Built a Hemisphere was delivered to the Coordinator of Inter-American Affairs. It was nominated for an Academy Award for Best Documentary in 1943, but lost to The Battle of Midway, Kokoda Front Line!, Moscow Strikes Back, and Prelude to War. 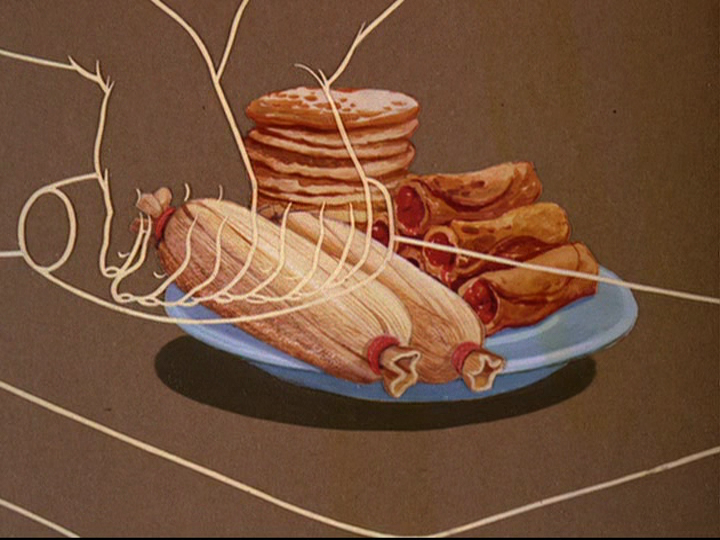 This short also includes a short segment from the 1938 Silly Symphony Farmyard Symphony. The short was directed by Bill Roberts. The short begins with an explanation of corn, and how it possibly came to be. The earliest version of corn grew on the mountains centuries ago, but was not noticed by hunters as they searched for food. When hunters were unable to find game, they were able to find corn and use it for food; this discovery is then credited as helping begin the civilization of the Americas. The narrator then directs the attention to the Mayan civilization, which was built around the growth and worship of corn, with great temples built in dedication to the corn gods, including Yum Kaax. The Aztecs also built a civilization based on corn, with their corn goddess named Centeotl. The Incas, located in the Andes, worshipped a sun god, who provided them with all they needed to grow their corn. The crop of corn spread around South America and all the way to Canada; it was also sent over the world through the conquistadors and spread from there. The narrator lists the various foods made from corn, including tortillas, succotash, and bourbon. Brought to present day, where it is explained that, thanks to advances in machinery, we can harvest enough corn in fifteen hours, compared to the 500 the Mayans needed. The next topic is how to inbreed corn, and the entire process is explained step by step. It produces small versions of the corn plant, but once two small unrelated inbred plants are cross-bred, that produces a stronger, larger stalk with more ears. Seventy-five percent of all corn produced in the United States goes to feed for livestock, with hogs eating the most of that percentage. After this, a scientific study of corn is presented, with an explanation of how the two parts of the corn kernel (the endosperm and the germ) are used to create oils and starches, which have a variety of uses. A hypothesis of how corn can be used to help the war effort is also presented, with the idea that corn can be used to create tough plastics, powerful fuels and explosives, tires, parachute fabrics, and more. Posted in Uncategorized and tagged 1940s, Propaganda, Short film, Special, World War II. Bookmark the permalink.